The flight from California to Sydney takes a full day, but two days by the calendar as you cross the International Date Line en route. You land in Australia’s most iconic city on the morning of the 23rd, spending three nights in downtown Sydney at the Hilton Hotel where shopping, dining and nightlife are all only steps away. Guided group activities while in Sydney include visits to Homebush Bay, site of the 2000 Olympic Games, and of course a comprehensive tour of the Sydney Opera House. Travel outside the city to witness the spectacular wonders of natural Australia. Close to the city yet a world away, Ku-ring-gai National Park contains the most concentrated collection of Aboriginal rock engravings in the world at over 1500 sites. At Blue Mountains National Park visit Echo Point, see Three Sisters rock formation and hear ancient local legends at the Waradah Aboriginal Center. Featherdale Wildlife Park offers the chance to have your photo taken with a koala, plus seeing kangaroos, wombats, dingoes and fairy penguins in their natural habitat. It’s time to board Holland America Line’s ms Noordam on February 26 for dinner and your evening embarkation. In the words of Goldilocks, she’s not too big or too small. She’s just right. A mid-sized ship (just under 2000 passengers), the ms Noordam offers graceful nautical lines, stylish public rooms, amazing food in multiple venues including America’s Test Kitchen, stunning shows and entertainment (how about B.B. King’s Blues Club?) and fewer guests – all with an ambiance of timeless elegance where every detail shines. Ports of call in Australia, Tasmania and New Zealand are weighted towards the latter, a reflection of many years of experience in this region. 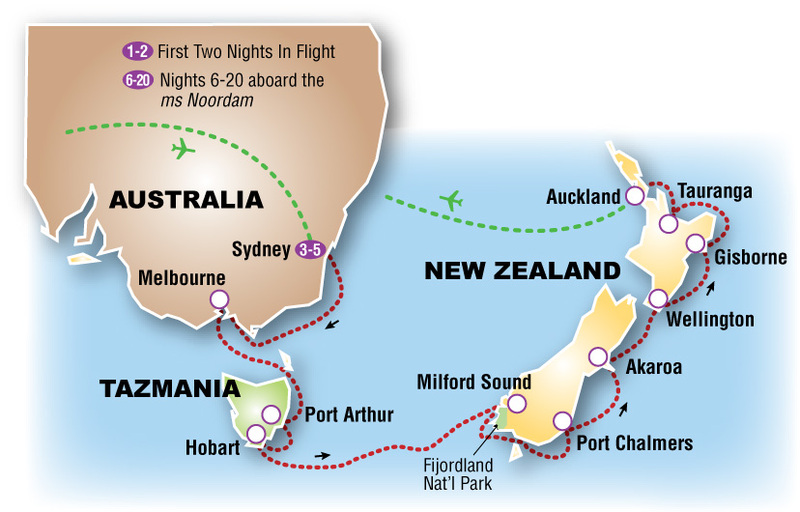 Australia may be why you are going, but New Zealand is what you’ll be talking about upon your return.